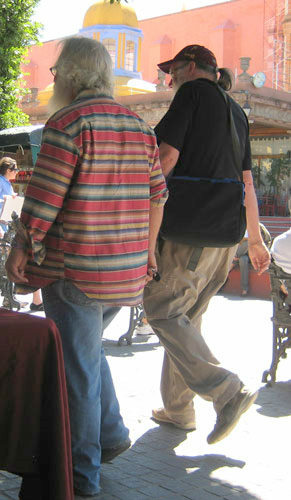 The first gangs in San Miguel developed this early, always classic look. It is a variation on pearls and the little black cocktail dress. The only colors are black and white and/or beige. 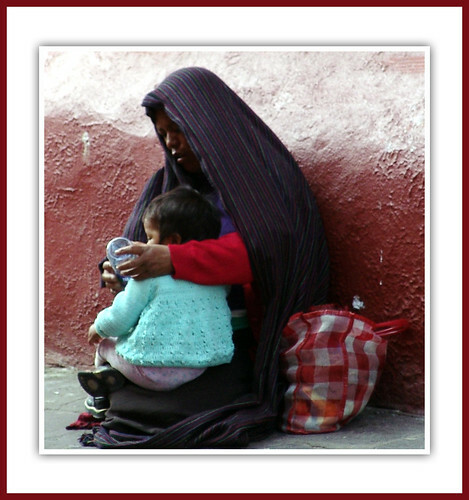 You will see no household items on their back, front, hips or shoulders because they have never taken an art courses. They have no need to be CREATIVE because they are the Patrons of the Arts. 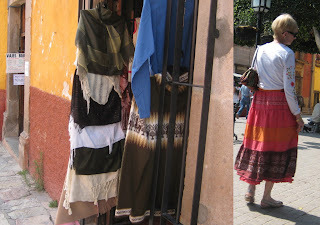 They define what is ART in San Miguel. 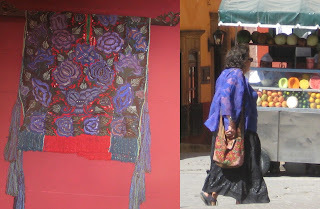 They never carry bags as they buy their ART at the openings and have it delivered to their CENTRO houses or HOUSE WITH VIEWS. Key words they use are Fabulous, Smart, Darling, Let’s do ……, New. Novice Gang members need lots of help before they can be admitted to the Gang. This Novice has been able to pass through the Eye of the Needle Test and this is her first day in the Jardin under the watchful eye of a Senior Gang Member. It is obvious from the picture what she needs to learn. It is almost a before and after picture. The Classic Gang is the meanest gang in the Jardin and has the most rules. Here is the detailed dress code for this gang for day time wear. 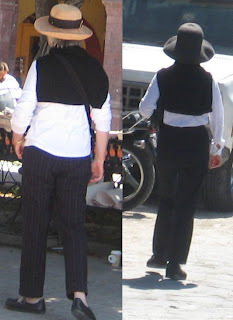 Smart beige, black or white hat with only a white or black band. Break the rules and expect retribution. 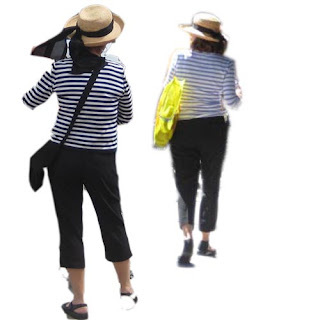 The woman below came to the Jardin in Bicycling Pants, in a blouse that was too big, wearing runners and with no band on her hat. She was banished from the Jardin tout de suite. She knows now that she will only be welcomed in the Campo. This person is not in the Classic Gang. She has broken three rules of the Classic Gang can you spot them? Here is another mistake? Can you spot it? Pop quiz – is this a Classic Gang member? Yes or no and defend your answer? This is a bit harder. Is she or isn’t she part of the Classic Gang? This Gang was started by one woman in her search for originality. 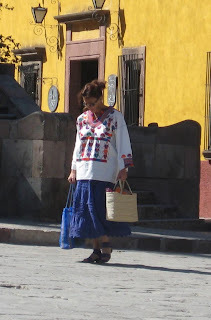 She has been in San Miguel for a long time as well as her trademark Parasol. She is a testament to persistance. 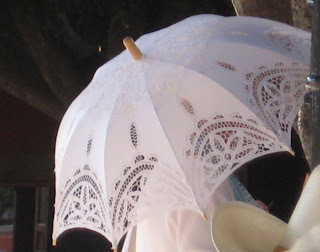 More and more women are picking up the Parasol, blocking the sun and hoping for rain. They taunt by yelling “No UV for me” and have been known to use the parasol as a weapon. This gang is growing far faster than people imagine. There is even a growing paper parasol contingent in the Jardin. This gang can only be identified from the Parasol. 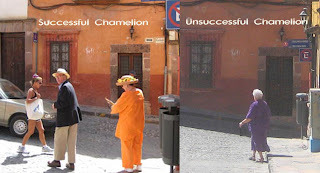 Remove the Parasol and confusion reigns. This woman has a Classic Gang hat but a Rug Gang covering. 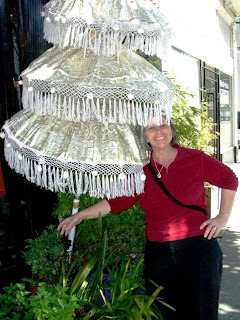 The discovery of this parasol by a contributor has the Jardin in a buzz. 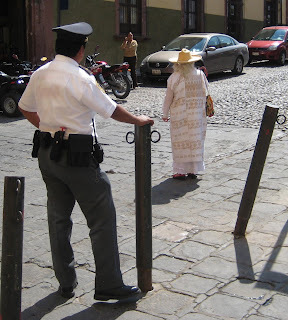 Gangs are competitive in San Miguel. Members of the Rug Gang are always trying to outcarpet each other. 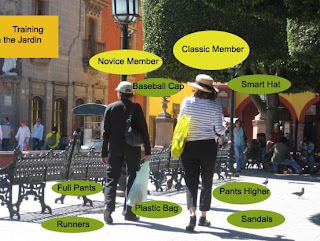 The various Hat Gangs are always swamming the hat vendors in the Jardin for something “new”. Imagine the excitement of the Parasol Gang with this new Parasol. One member has even coined a new slogan “Here Comes the Shade”. So be prepared to lose the sun. This Gang constantly need new members and send shills out to the Jardin to find new members. The Parasol Gang was out this day. 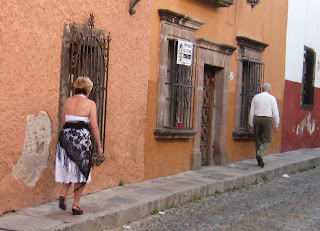 They start by searching the Jardin for unattached women – well unattached women who seem a bit lost – well unattached women who aren’t seated – well any unattached woman even though that is most of San Miguel. She looks up and down and then begins the March of the Parasol. A twirl here, a glance there – always on the lookout for eye contact. After a good lengthy March, she stops to see who has noticed her. She finds a Cowgirl and collapses her umbrella for a heart to heart. Divorce talk usually is a good way in or the Magic of San Miguel or anything about shoes. 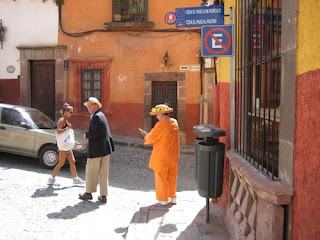 The talk moves to what do you do all day in San Miguel and Doris our Chinese Parasol Shill has her opening. But Doris is not alone. There are many parasols and many shills. Sometimes Cindy takes the blue parasol and tries other parts of the Jardin. This was a happy day in the Jardin when the leader of the Picnic Tablecloth Gang was expelled by Police Officer from the Jardin. But with so many ways to enter the Jardin we know she will be back. The Picnic Tablecloth gang broke away from the Tablecloth Gang because they only like to eat out door. Ten Ten Pie is a favorite hangout for them and there was quite a disturbance last month when a French family tried to eat lunch on a seated gang member. She stays in the doorway. Her friend is in the store buying her new gang clothes. Decisions, decisions, decisions. Should she join a gang or should she keep her old identity? She doesn’t know who she is anymore. She was a small town accountant back in the States but who will she be here? Will she be an actress or a sculptress? Will she have been the mistress of a famous shoe maker or Don Knotts? Will she tell people she has to avoid Doc Severinsen in the Jardin? Oh which gang? Is she a rug girl, a false boy girl, a classic girl? Does she have the flair to wear a tablecloth? Can she get a love slave? Life is hard for the newly arrived. Several people have asked where do Gang members get their clothes. Often they are hanging just in front of you. This wall hanging was used very successfully by this gang member. It is not always easy for Gang members. This poor gang member was wrapping herself in a chair throw when her love slave started to escape. As she ran to catch him the open weave of the chair throw got caught on a door knob and he got out the door. Since she can’t leave the house without wearing her gang outfit she tied it loosely around her hips and began to run after the escaping love slave. But he has a good head start. Again another gang member has experienced the downside of open weave. 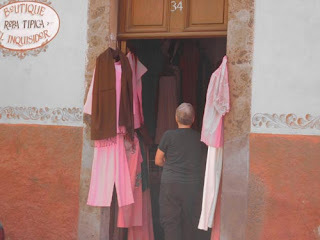 There is an interesting short film by Caren Cross called Lost and Found in San Miguel . I had a tough time figuring out in the film who was Lost and who was Found. I wasn’t sure if the Lost part happened before they came or after them came to San Miguel and even more confused about what they had Found. As I looked around to find what they had found my blog was formed. The Found have found a sense of belonging that manifests itself in what I call joining a Gang – a gang you can’t find at home. 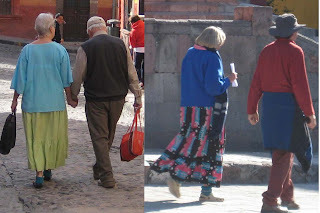 Each gang has its colors and dress code and unique behaviors. 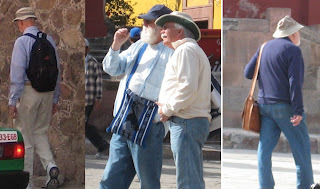 There are few men in San Miguel. Most men have been captured and are Love Slaves for female gangs or are gay and beyond control by women. There is a surprising trend in Male gangs. The Mini Male Gangs or Psuedo Female Gang.